Collection of ‘Cool and Creative Chopsticks’ from all over the world. 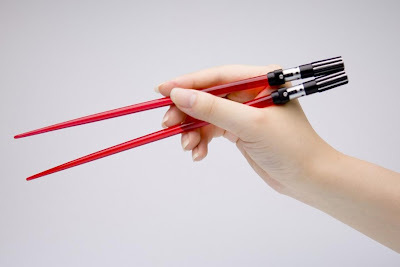 Starwars Chopsticks: 'Chopsabers' perfect for eating or defending the galaxy. 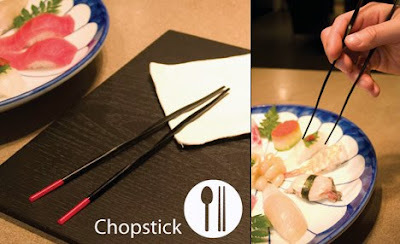 Flostick Chopstick: It's a disposable chopstick that peels off layer after layer. 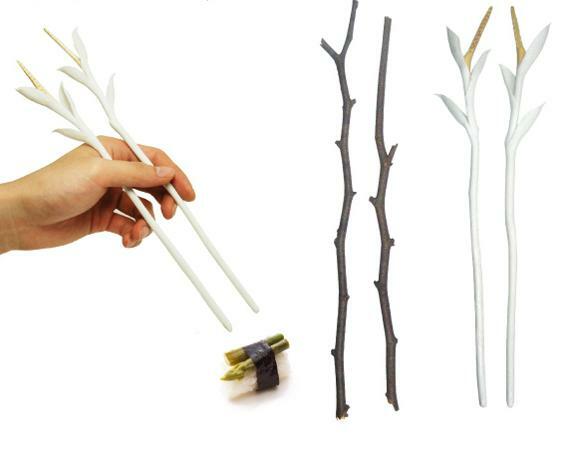 "3leaves were placed on a discarded branch in order to endow the functions of a chopstick. 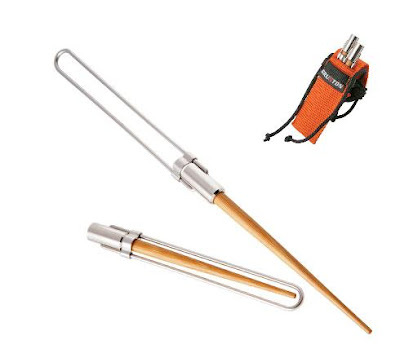 When a leaf falls off and hits the ground, it will have accomplished its final role.."
Tukaani Chopsticks: These are quite easy to use as they are already linked at the top. 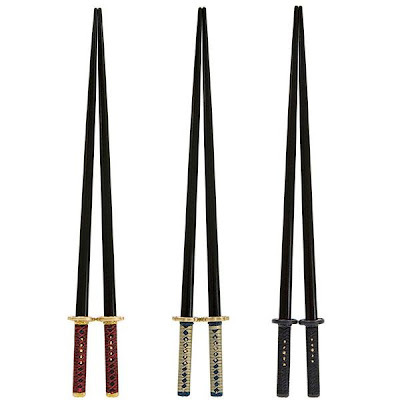 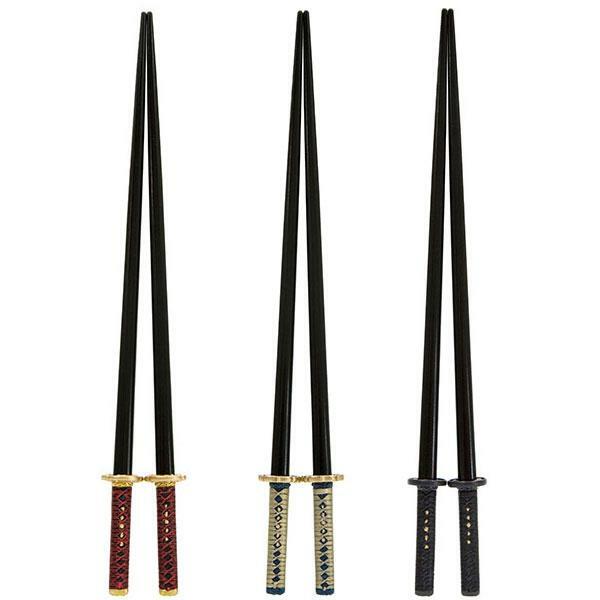 Samurai Chopsticks: "There are three sets of chopsticks in the samurai sword series, all named after actual 17th century Japanese samurai." 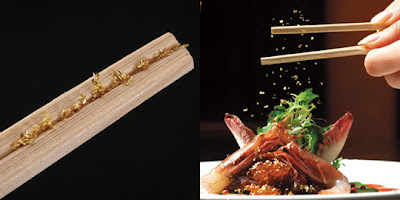 Kinbashi Gold Chopsticks: These wooden chopsticks are packaged with tiny goldflakes between them and when you separate them over your plate, sparkling goldflakes sprinkle down over your food. Chopsticks Plus One: Its a combination of chopsticks and spoon, that can be used together or separately. 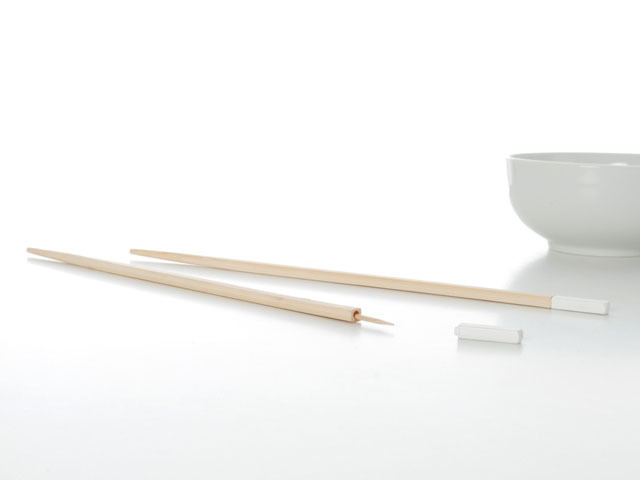 Chopsticks Plus Two: It combines chopsticks with toothpicks, all in one. 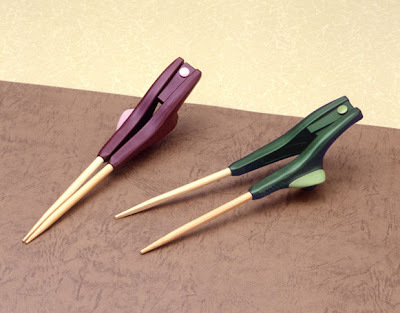 Clothespin Chopsticks: These come with a metal spring for easier use, best suited for beginners. 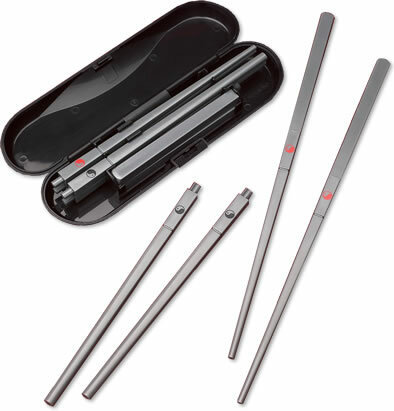 Carbon Fiber Chopsticks: High-end carbon fiber chopstick set with matching carbon fiber rest from Carbon Fiber Gear. 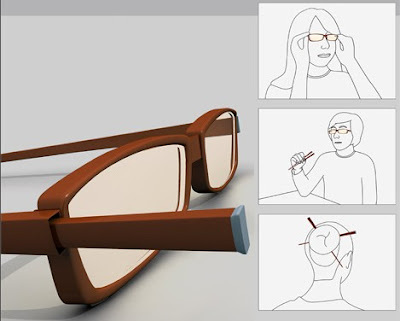 Glasses Hold Your Chopsticks: The frame offers casing for the stainless steel tipped chopsticks. Folding Chopsticks: These fold to half the normal length for easy storage. 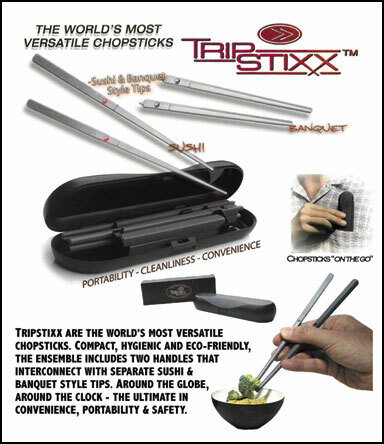 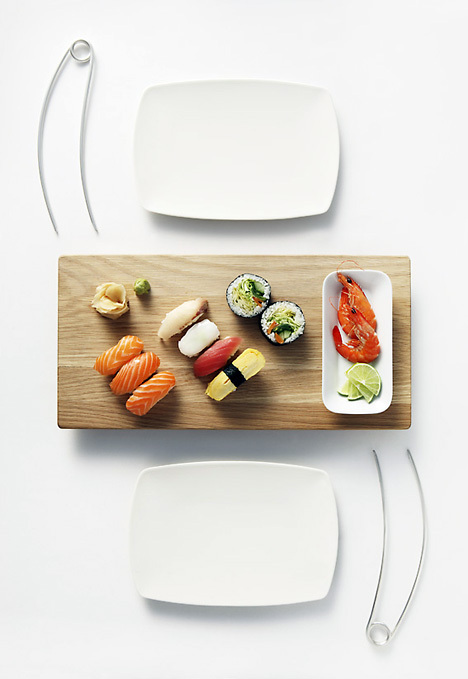 TrippStixx Chopsticks: "One set of handles, two sets of interchangeable tips: Banquet Style and Sushi Style." Pencil Chopsticks: For this one you can use regular pencils as your chopsticks. 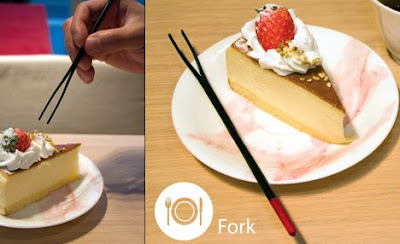 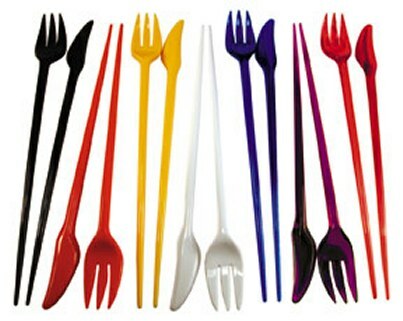 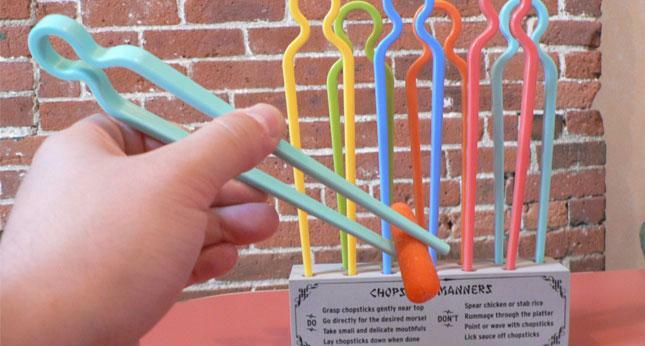 Forkchops Chopsticks: These allow you to switch over to a knife and fork when you had enough with your chopsticks. 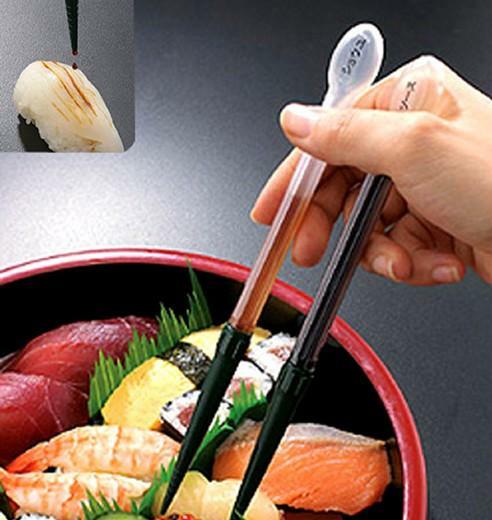 Sauce Dispensing Chopsticks: "With these sauce dispensing chopsticks you'll never have to dip your sushi in soy sauce again." 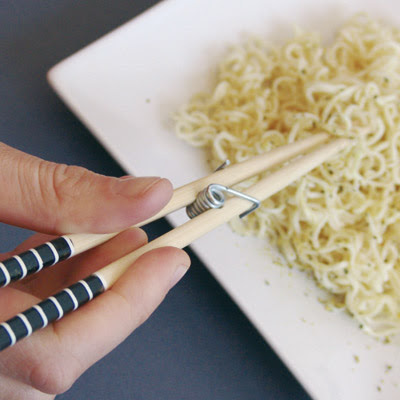 Narrowed Chopsticks: These were created for those who don't use chopsticks on a regular basis but would like to look like they do. 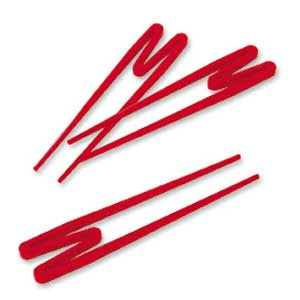 "These chopsticks have been slightly narrowed towards their upper ends to make them easier and more comfortable to grip." Party People Chopsticks: This one is sure to build confidence and make anyone an expert. Mater Angle Chopsticks: Ergonomically shaped stainless steel chopsticks by Mater. Magnetic Chopsticks: Stickpecker's magnetic chopstick recreates the feeling of pulling apart wooden chopsticks. 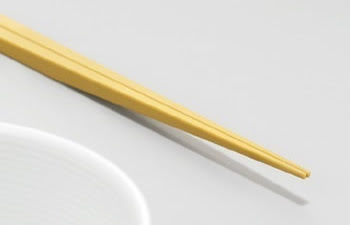 Steel and Wooden Chopsticks: Remove the top section and slide the lower section out. 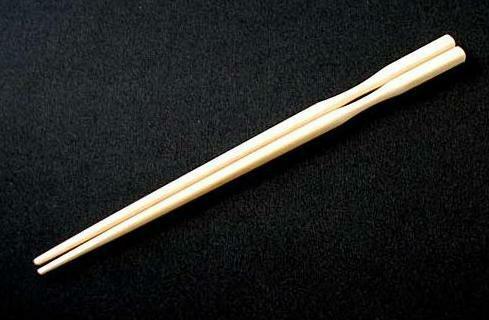 The wooden tip fixes into the upper section and now you are ready to eat. 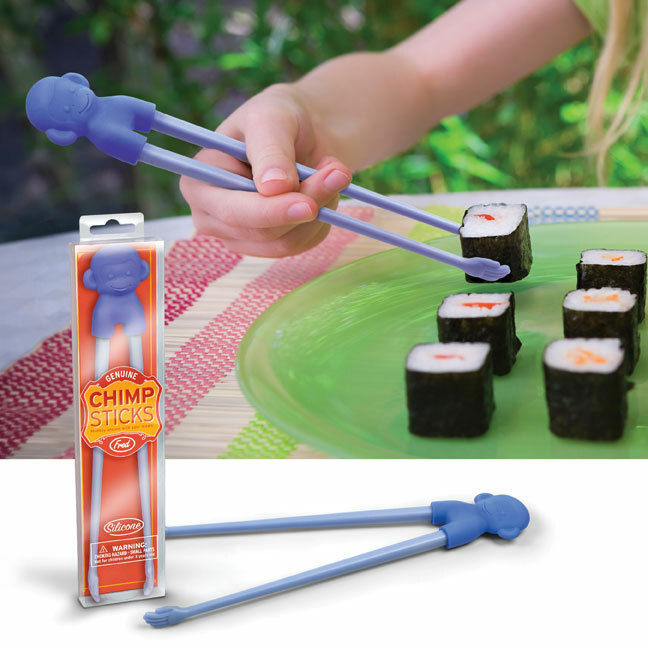 Chimp Sticks: For the little ones, it has little hands on the tips. 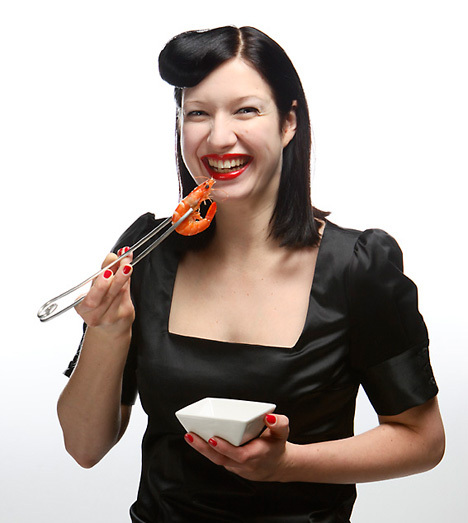 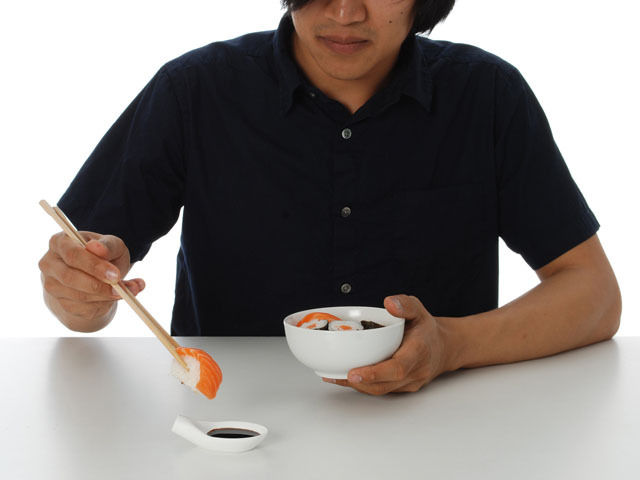 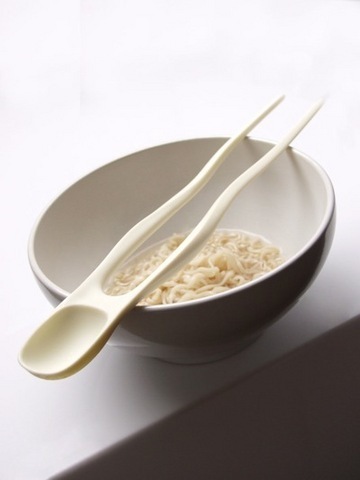 Froggetmee Chopsticks: Two-in-one utensil, a combination of regular chopsticks with a soup spoon. 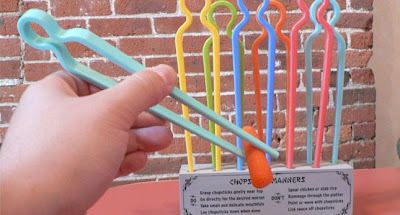 Chopork Chopstick: A creative idea, two sticks turning from a fork to chopsticks. 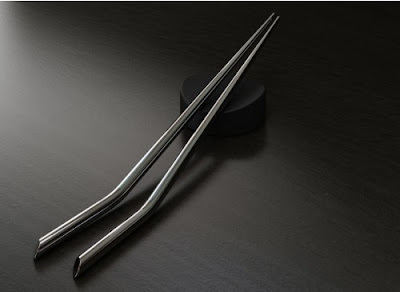 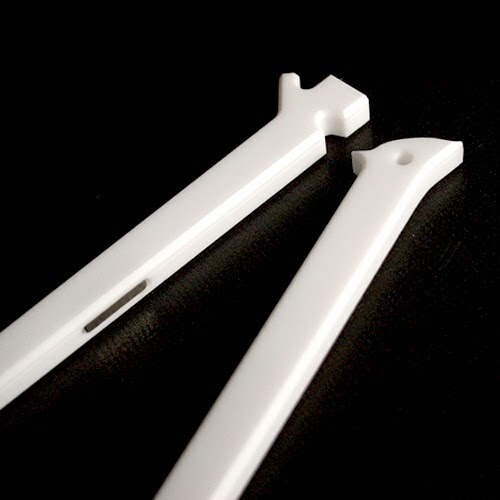 Chork Chopsticks: It's a combination of fork and chopstick design. 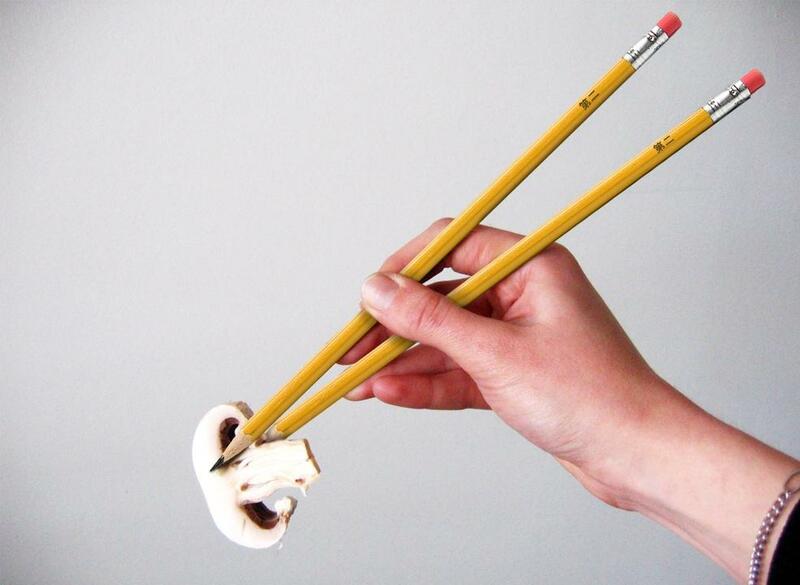 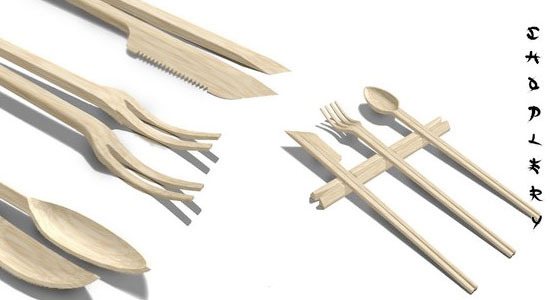 Compact Chopsticks: Convenient yet still stylish, comes with its own carrying case. 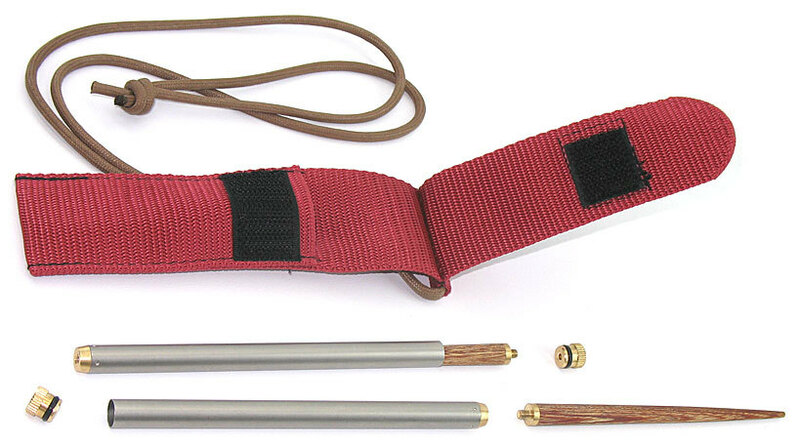 Vargo ChopstiX: These are a lightweight and simple alternative to Western cutlery. 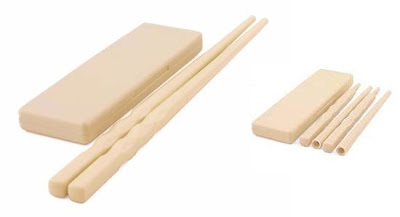 Kobayashi Chopsticks: These don't need a chopstick rest due to their shape, the tips won't touch the table when they're set down.